This is a very special award given to midshipmen who have won four Brigade Boxing Championships. This award is in the name of Tony Rubino who arrived at the Naval Academy in 1947 as an Assistant Boxing Coach to Spike Webb. In 1954 Tony took over the Head Coaching duties and coached until 1963. He then became the Deputy Physical Educational Officer until his retirement in 1982 at which point he was honored with Professor Emeritus status. The Sportsmanship Award is presented in honor of Coach Emerson Smith or "Smitty". Emerson arrived at the Naval Academy in 1957 as an Assistant Coach in Boxing and Basketball. In 1964 he became the Head Boxing Coach and coached until his retirement in 1985. Coach Smith wrote extensively and was very proactive in ensuring that boxing was a safe sport. With engineering professor Jack Smith, he conducted research on twenty different materials resulting in a combination of materials still used today in boxing gloves and head gear. 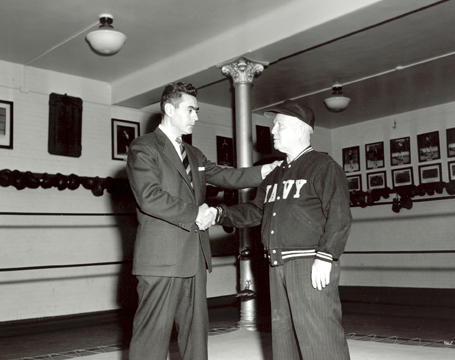 Spike Webb was Navy's first boxing coach from 1919 to 1954. In his first season as coach in 1920, Navy went undefeated in intercollegiate competition. Navy was to become a boxing powerhouse and would go on to remain undefeated individual meets for the next eleven years. During that time, Navy captured six National Titles. Spike coached four U.S. Olympic Teams between 1920 and 1932. From then until his retirement on June 30, 1954, Spike Webb was as much of a landmark at the Naval Academy as Tecumseh. Spike is the father of Navy boxing. The Webb trademarks a well-worn baseball cap, sparkling blue eyes, and a Navy warm-up jacket, were never absent from Macdonough Hall, where the taught mids the famous jabbing, skipaway style that saved Gene Tunney from Jack Dempsey in after his "long count" knockdown in 1927. 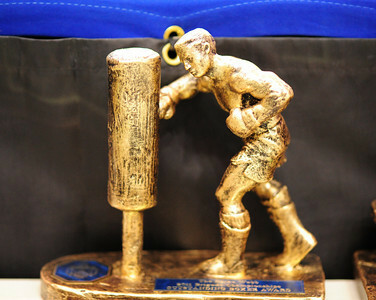 The Most Improved Boxer Award is presented in honor of the memory of Christian P. Dobleman, Class of 1988. Chris died October 26, 1998 after a courageous fourteen month battle with cancer. He was 32. Chris excelled as a midshipman. Of all of his many accomplishments at Navy, he was most proud of his boxing career that culminated in his 1987 Brigade Championship. 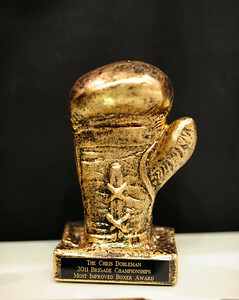 The Chris Dobleman Award is an annual award presented to the Naval Academy Boxer that best exemplifies Chris? courage and determination. 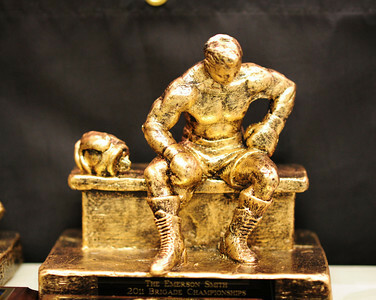 The award is given to the member of the Naval Academy Boxing Team who is judged by his coaches and teammates to be the most improved member of the squad. The award winner had demonstrated dedication to the Naval Academy and to the sport of Boxing.